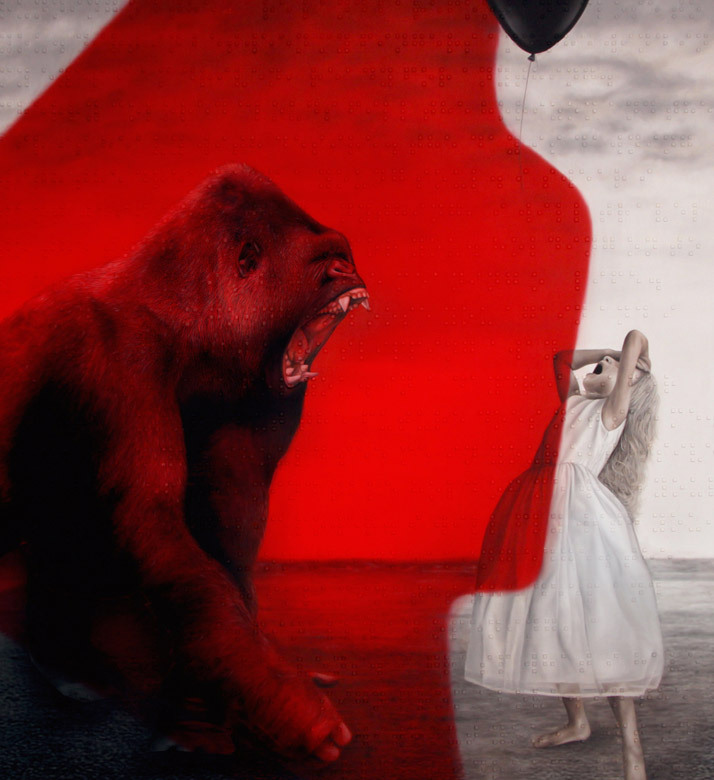 It seems destined that Roy Nachum’s show 'Open Your Eyes' would be at the Joseph Nahmad Contemporary Gallery in downtown New York City (450 West 14th Street, NY). Rather than a traditional white box gallery, this is a complete raw space, with exposed brick and an empty warehouse vibe providing an unassuming backdrop for Nachum’s detailed pieces. With a focus on perception and a common theme of how a subjective point of view can be limited, the raw brick and abandoned building feel instantly makes the art the star. Simply put, it is a stunning sight. Yet, once you enter, you realize there is so much more to this art experience than what can be seen. As Yatzer reviewed at the opening of the show in May, 'Open Your Eyes' is 32-year old Nachum’s second exhibition; a show that explores how humans look at art and what the art experience might be like for the visually impaired. 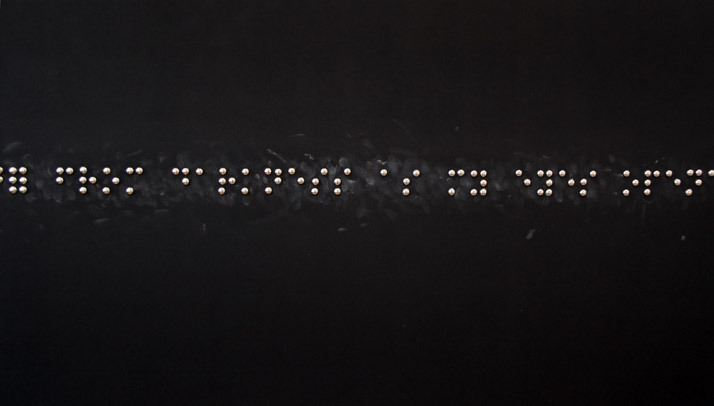 Inspired by braille signs in the stairwells of a museum, Nachum began to think about the art itself; if one cannot touch it how can the visually impaired appreciate the art and furthermore how can this understanding enhance the art adventure for a person with sight - who’s very perceptions and experiences in life have infringed on their point of view? 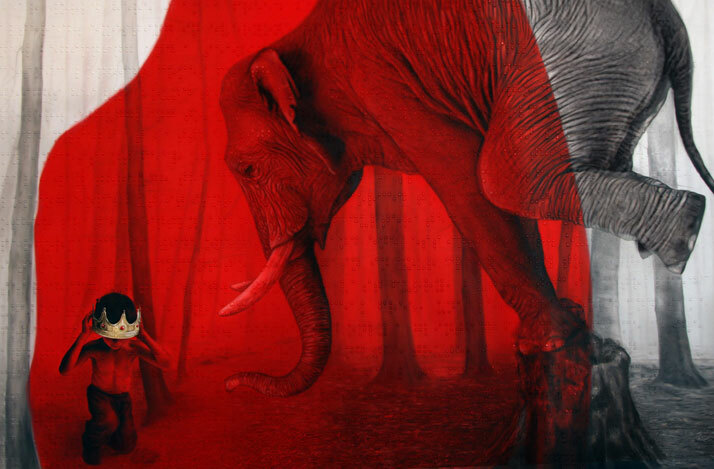 In fact, the more we learned about Roy Nachum’s process it becomes evident that nothing is an accident in his pieces. They are carefully thought out, painstakingly detailed, and cerebral yet, layered with meaning and emotion. Take, for example his Parallel Realities series. 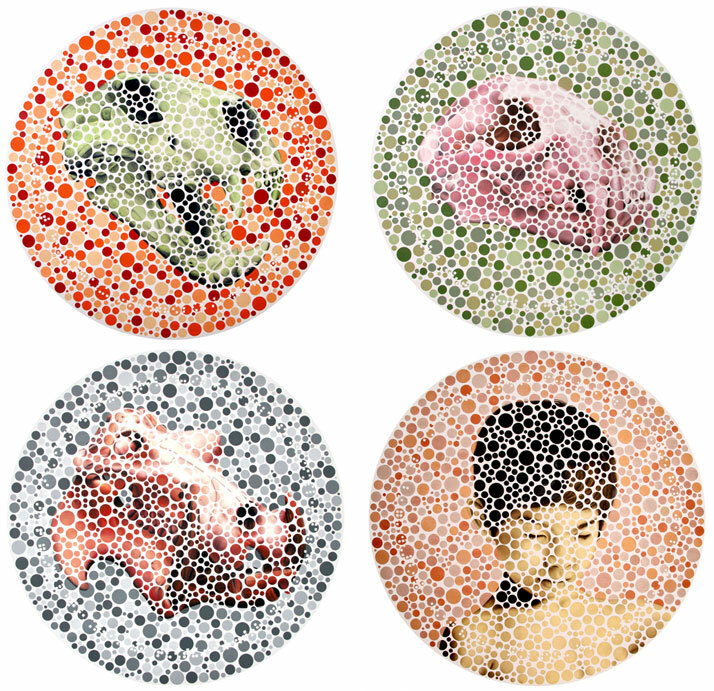 Upon first sight you have realistic paintings with large convex braille squares popped into the canvas, showing the animalistic or primal subconscious of a state of mind. 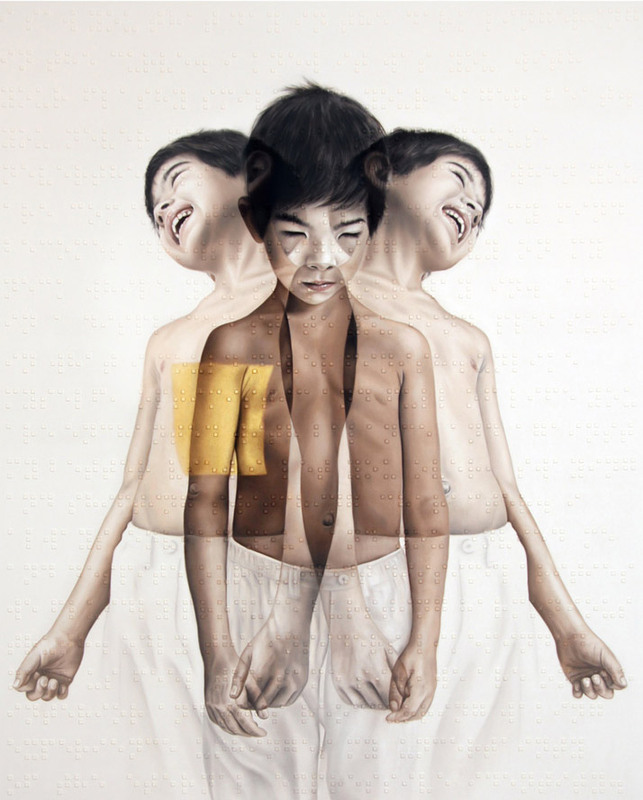 There is also a poem written in braille within this painting. 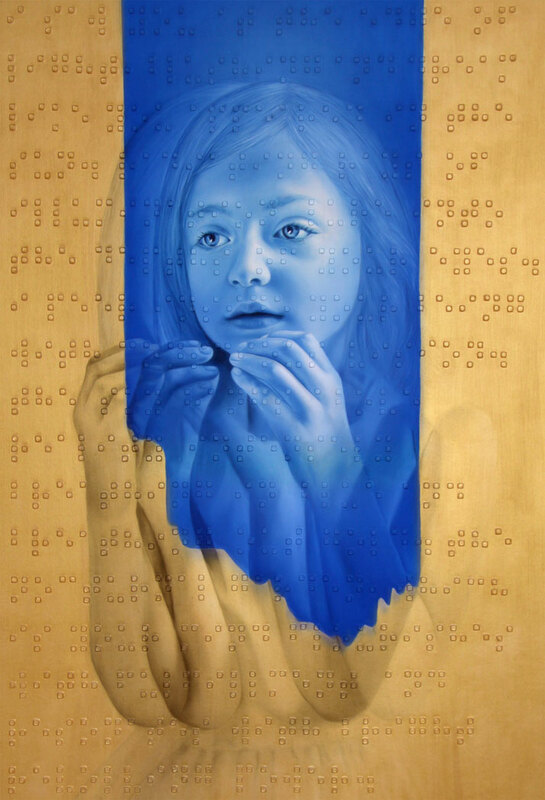 A blind person can run their fingers over the braille and understand the scale of the painting while reading a poem that expresses the emotional component of that particular painting. 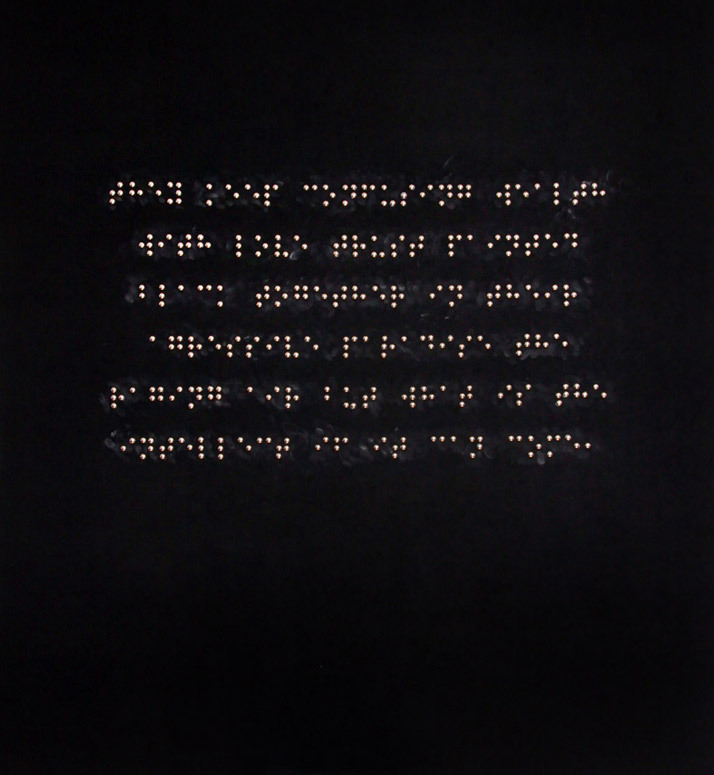 Therefore the braille poem is a 'way into the piece' for the visually impaired. 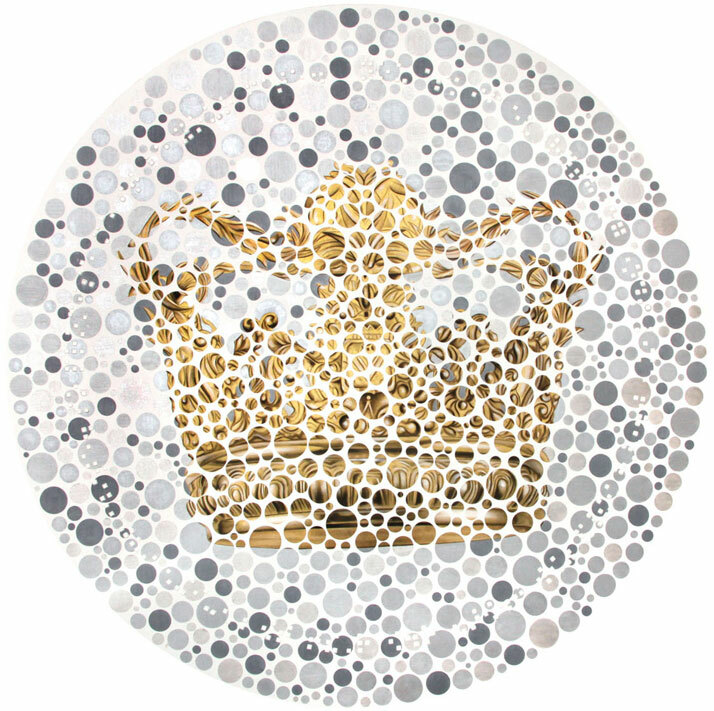 During the process of putting this show together, the artist worked with Lighthouse International, a non profit group that works with the visually impaired to offer new and innovative ways to help people overcome the challenges of vision loss and to enjoy productive, active and independent lives. Nachum invited a group of volunteers from Lighthouse (all with various degrees of vision impairment) to come experience the show. 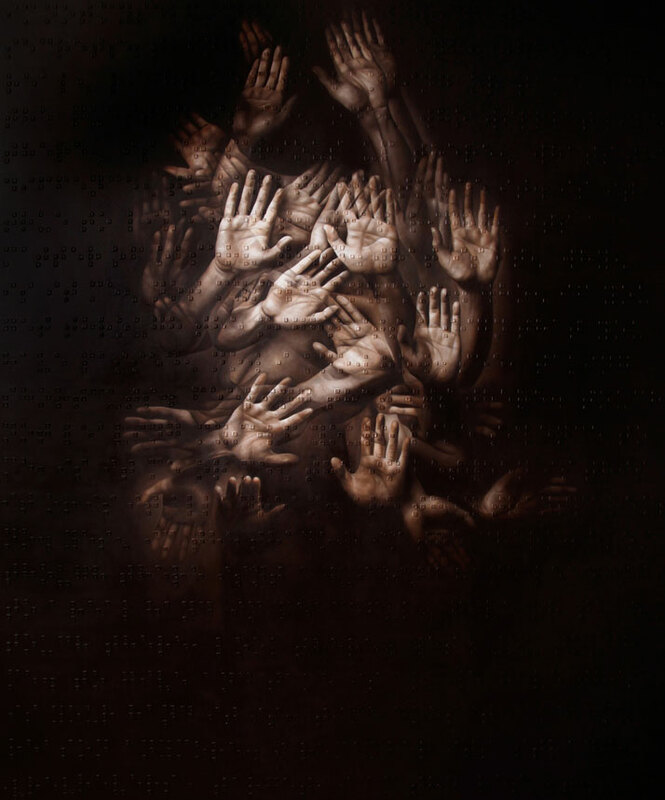 These volunteers became a part of the art itself by running their hands over the braille on each painting, and in the case of the Invisible Mirrors series, leaving a trail of chalk from their fingers on the canvas. This interaction therefore almost served as the ''finishing touch'' on these pieces. 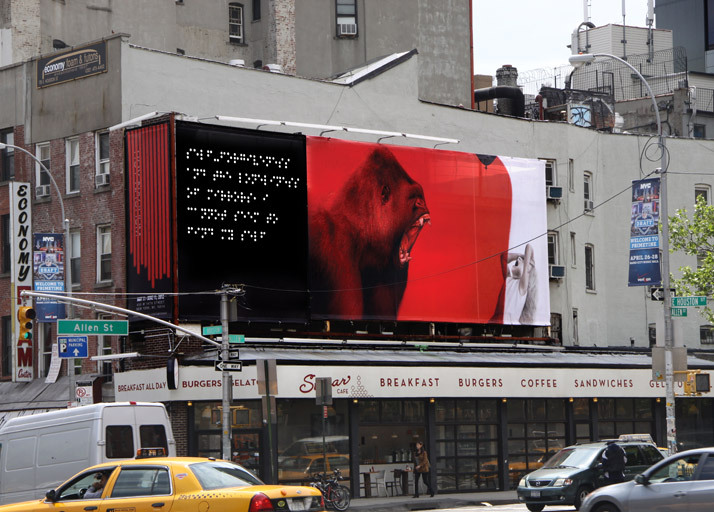 To properly share the experience of 'Open Your Eyes', Yatzer sat down with the artist himself. 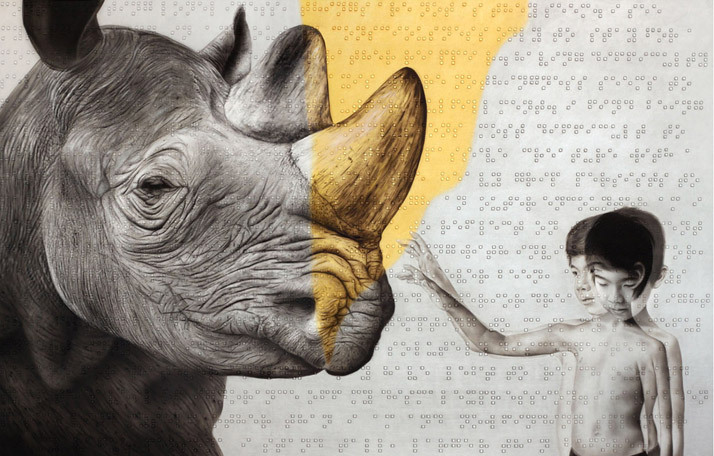 Here in an exclusive interview, we asked Roy Nachum about his show, about his experience in creating art for the visually impaired, and how his work has opened his very own eyes. I always like to start at the beginning of the artist’s life to get an idea of who you are. Did you know you would create art as your career? Who or what were your inspirations in becoming the artist you are today? Did you go to art school? Art has been my life for as long as I can remember, I have been painting since the age of four. As a child my father painted and I always loved to watch him work. I recall the first painting he finished that really made an impression on me, it was an oil painting of a clown. It was so incredibly realistic. I was fascinated. I could not comprehend how someone could create something so life-like with only paint. This moment is one of those moments you never forget as it inspired me to paint the way I do today. Both of my parents have influenced me greatly and their support throughout my career has been a blessing. I studied at the Academy of Art Bezalel in Israel and then moved to New York to continue my studies at The Copper Union. Do you create each day or does it come in spurts? Art is my life, creating is like walking up in the morning and drinking a glass of water, it’s something I can’t live without doing. Even when I am not physically painting my mind is always in a creative process. Do you paint/work during the day or at night? I wake up in the morning and begin to paint; I end up working for 16 hours straight with no breaks everyday until I have finished the piece. When I paint I can’t feel my body, I just paint, nothing else matters - I have set out on a mission that I must complete. This is an impressive collection of work. Do you find it hard to shift mind gears from writing to painting? Do you paint first and then write the poems based on the image or the other way around? I create them together. The text is parallel to the painted image and represents the inner feelings I have towards the piece. When I close my eyes I can clearly see the image I want to paint, it’s almost like a dream. From this, I then create the poetry trying to capture the right words to go along with my visions, in hopes that those who are blind will be able to get the sense of each piece of work. Did you find painting to be a limitation to express what you want? 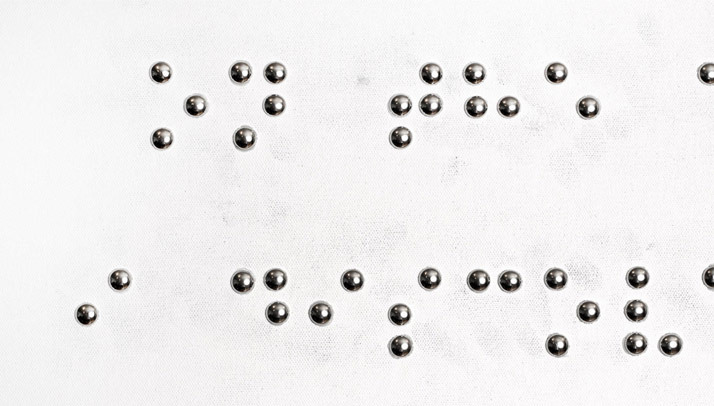 Are the braille poems the answer to this problem (in addition to providing a gateway for the visually impaired to 'see' your work)? How do your words enhance your paintings in this case? Visually impaired people can experience my art; they are all of a sudden included in something that before was very abstract to them. Plus the poetry is another way for me to express myself on the canvas and give viewers a way into my art. 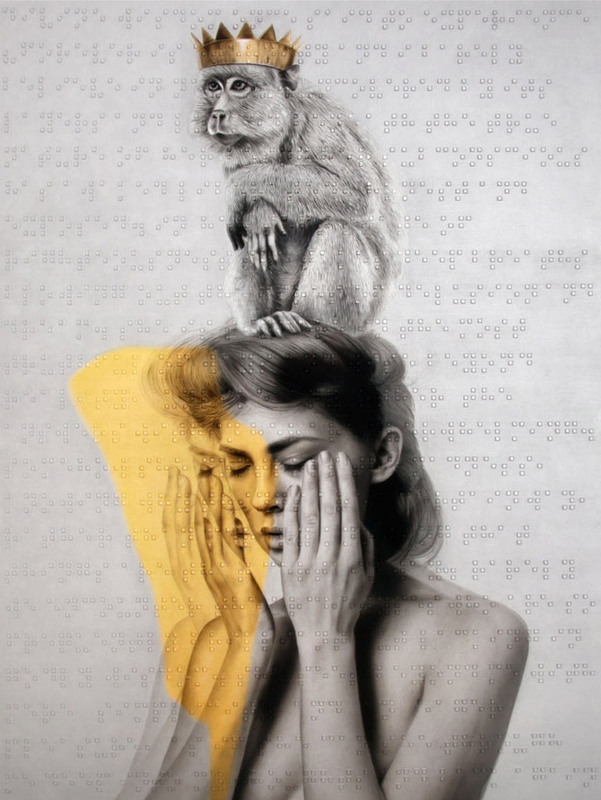 Your poems written in braille are quite personal. You are essentially revealing a vulnerable side – but to a certain audience only, through a language only they can understand. Is this the equivalent of a whisper? Did you purposely camouflage your innermost thoughts? I open myself up when working on these poems; I believe they come from somewhere I have hidden deep inside. 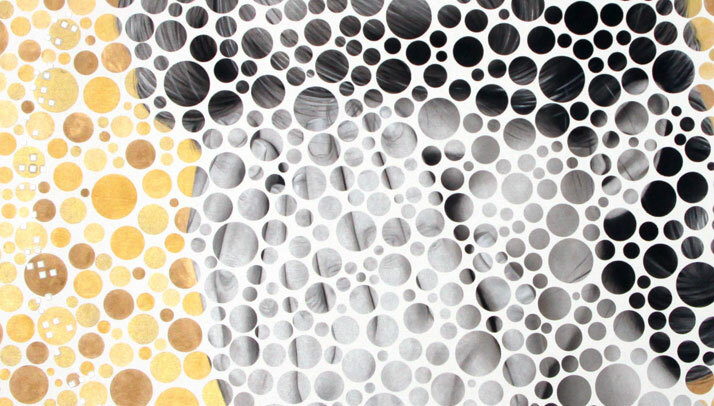 I like to think that each abstract will enable others to view secretive vulnerable feelings. It’s like opening the lines of a painting. There is a lot of the color Red in this exhibition. What does this represent in this context? 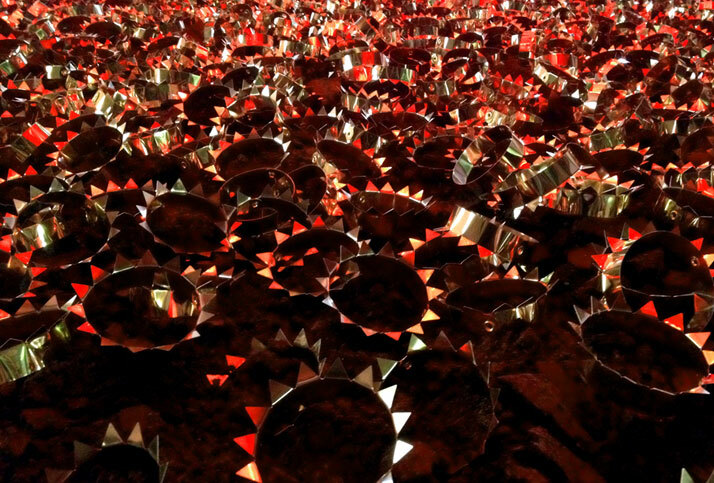 Even in Sea of Crowns, the gold crowns reflect the red installation hanging above. Why red? Firstly I feel it is the right color to use, just through my creative process with the piece. It is also very dramatic and expressive. But most of all it is a metaphor for the human being’s internal system. We are all the same. 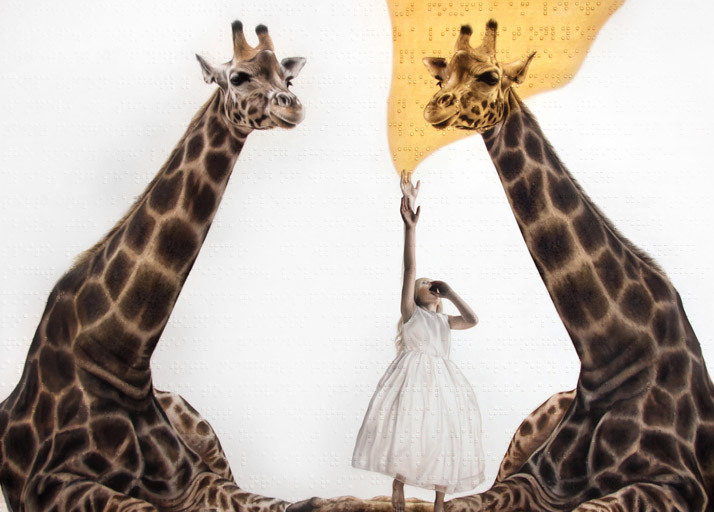 In the series Parallel Realties, the animals represent an altered state of consciousness of their human counterparts. 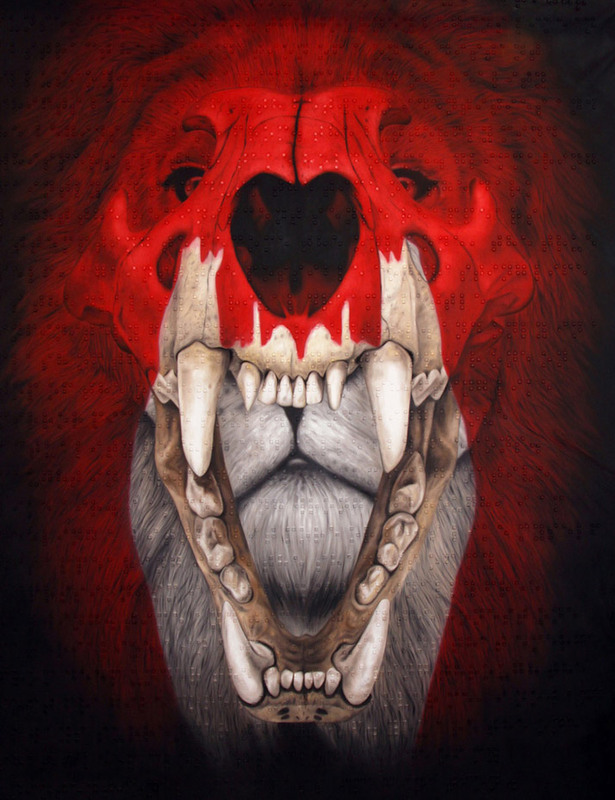 As with the animal skulls in the Color Blind series my inspiration was the endangered species of our planet, with 'Our Eyes Shut' we are destroying this earth and all of the most beautiful and regal animals that roam freely upon it. With this piece I decided to paint my hands instead of my face. I live and work in New York, the busiest city in the world. So many people, so many faces, so many different kind of faces and I ask myself what makes one face better than another? Other than what we think we see? For a Blind person their hands are their eyes, and in order to touch someone else’s face they would need to become very personal with that person, they would ultimately get to know that person on a deeper level rather than just judging them based on their face. To quote you, 'A lot of people with sight don’t really pay attention to the real things in life and don’t see what’s in front of them. '… Would this include you? Would you say this collection of work was your attempt at opening your own eyes as well as others’? We all have this issue from time to time and some of us more often than others. It is my moral in life to pay attention to detail and try to see beyond the obvious and not to take anything for granted, but it not an easy one, we all get caught up. My work is simply a way for me to make a difference (small or big), to do something new and to Open Peoples’ Eyes - me included. Have you achieved what you wanted to here? Did your exhibition turn out as you planned or were you surprised at the finished product? I am very happy with the way the exhibition turned out, but for me if I can change only one person’s view and perception of life I have achieved what I have set out to do. Did you find the part of yourself you hoped to uncover? Are you changed by this work and/or by watching others interact with this work? Or is this something that creeps up on you, something you won’t realize until you look back or create another group of work? Every group of work greatly affects me and I feel like I am always evolving with my work. But what influenced me significantly was seeing and hearing the reactions of visually impaired people when experiencing my art and getting to know some of them and having the pleasure of hearing their life stories. This has affected me in a way I never imagined. Thank you for taking the time to sit down with us. Blushing and dream like you appeared in the sun. Radiating rays of illumination lure into the depths of your eyes. The sky hangs above reality intensely breathing in blue and breathing out gold. Flourishes with fulfillment and resonates with bright resolving power.